The Home Maintenance by Brightnest iPhone app is filled with fresh, insightful step-by-step guides and cool ideas to take care of your home and family. The clean, tidy, and sophisticated interface and scheduling system incorporate content that is an appealing combination of Pinterest, ApartmentTherapy.com, and Real Simple. The registration process is quick and easy. You can create an account with an email, or you can log-in with Facebook. You can set your Facebook privacy settings to control posts to your timeline. When you establish an account, you can also access the content at Brightnest.com. You select topics that interest you to filter the feed of information. You can select from categories like green, healthy, savvy, curious, clean, handy, creative, and hungry. 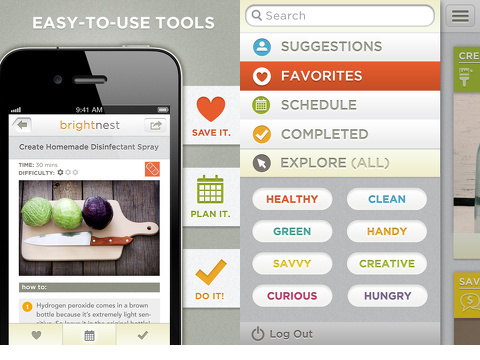 The home screen for the Home Maintenance by Brightnest iPhone app is bright, clean, and efficient. You scroll through an attractive stream with vertical swipes. A sophisticated photo is framed with the category; title; and ability to like, add to your schedule, and mark complete. With a touch on the photo, you are transported to a new screen with engaging, yet concise perspective and instructions. You will find a brief introduction reminiscent of the fun, smart writing at ApartmentTherapy.com. Then, there are clear directions to accomplish the task. You can share to Facebook, Twitter, text, and email with one touch. The sliding left menu brings effective, simple navigation tools to the Home Maintenance by Brightnest iPhone app. The suggestions feed gives you customized ideas and information. You can touch the calendar icon at the bottom of the photo to add to your schedule. You can add a task to your schedule next week or next month, and the Home Maintenance by Brightnest iPhone app selects a date for you. For the detail-oriented, they may appreciate the ability to select a date and set a reminder. When complete, you can check the home icon. You can also access your favorites feed and completed tasks from this sliding left menu. The interface to filter content by categories is excellent as well. Instead of a lengthy list that involves scrolling, the categories are bright, graphic tags organized in a matrix. The excellent content and tools coupled with the successful, smart interface make Home Maintenance by Brightnest a must-have lifestyle iPhone app. 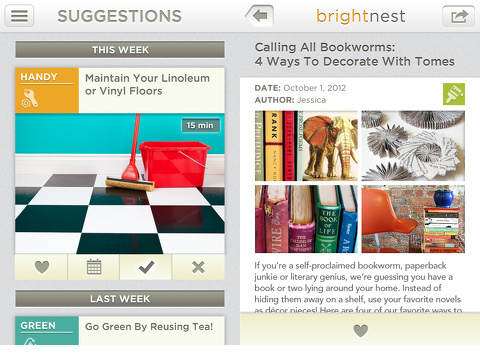 AppSafari review of Home Maintenance by BrightNest – Home Organization, Cleaning Schedule, DIY Crafts and Home Design was written by Jenni Ward on April 10th, 2013 and categorized under App Store, Free, Homes, Productivity. Page viewed 5123 times, 5 so far today. Need help on using these apps? Please read the Help Page. Application essential for the organization of the house. It is our lives easier technology.